John G. Brittle Jr. doesn’t have an office. He has a war room. The space, crowded with maps, charts, books, piles of paper and marked-up spreadsheets, is ground zero for InfillNashville, the 10-person team of site selection specialists that Brittle leads at Village Real Estate Services. Brittle and his group are matchmakers of sorts, tracking and plotting neighborhoods targeted for development all around the city – from East Nashville and the north side to the red-hot Nations district in the west and down the Nolensville Road corridor. They search for lots and facilitate their sale to builders, developers and/or homebuyers who want to build on them – fill in the property. Brittle spends most of his days out on the street, scouring neighborhoods from his cluttered Yukon, scouting lots, assessing traffic patterns and talking to clients and residents. He’s affable but intense – thinking, talking and moving quickly, with the ability to call up detailed neighborhood data from memory, a quick flick through piles of paper or from one of his equally sharp staffers, who include a former Metro senior planner. Brittle, a Realtor/developer, also is spearheading an initiative to provide property valuation information for those in communities targeted for infill development, working with Andrea Woodard of Bob Parks Realty. Now 50, Brittle has been working in real estate half his life. And while he’s often the target of anger from those who see third parties profiting from each tear-down, Brittle’s motivations are more complex. He’s a self-described “old house guy,” a “woods and land guy,” and a smart growth advocate who believes higher density and urban development is the best way to preserve Middle Tennessee’s open spaces, as well as keep Nashville’s taxes low. And one of his biggest concerns is making sure homeowners – especially the elderly – know the current value of their property so they will not undersell it to unscrupulous developers and middlemen. Brittle’s InfillNashville team is currently handling 90 homes, lots or pads that are under construction, in pre-construction, under contract or pending in some stage of due diligence. That number doesn’t include lots in the negotiation stage. Brittle took time out from the field to explain how density benefits Nashville, why sellers need independent information about land values, and why ethical business is ultimately good business. 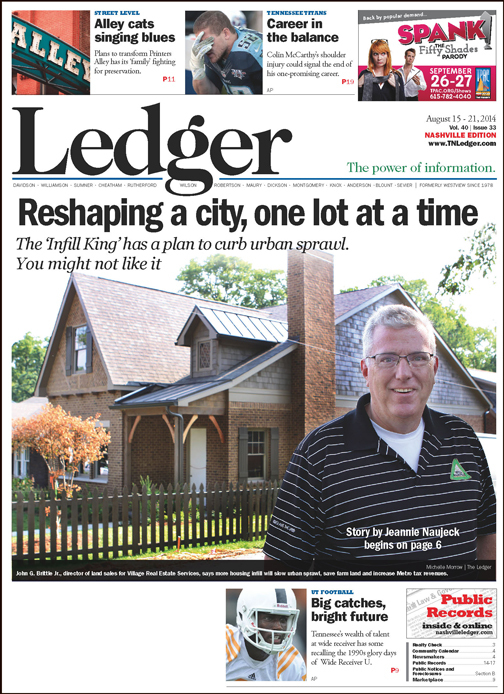 Q: You’re known as the “Infill King” of Nashville. Have you always been into real estate? A: (Laughs) “‘King’ is strong. But we’re leading the charge, or we’re out there in the front at least. I’ve been in it 25 years, and I think some of my life experience with my parents probably had a lot to do with it. When I was in second or third grade, they moved a house from where Thompson Lane goes over Franklin Road. It was Judge Hamilton Gayden’s house. And they drove by one Sunday, and I’ll never forget it. “There was a bridge going across Franklin Road at that time. There was just an intersection and this was the last house on the road. Q: Some people might find this personal history ironic, given that your business involves so much tear-down. “Some might. I’m an old house guy. I love old houses. My wife and I, our first house was on Central Avenue. I’m currently writing a book about historic homes in Nashville. We’re documenting every house in Nashville over 100 years old, because that’s what I like to do. “I spent all of my formative years in real estate in Nashville working historic neighborhoods, and we don’t tear down stuff that doesn’t need to be torn down. It’s not the right way to do it. Selling land to builders and developers and homeowners to build new houses is a part of that, because people want to live in the city. It’s what’s going on across the country, and it’s what’s going on here in Nashville. “I’m a land conservationist in the Teddy Roosevelt sense. We believe that we should not be sprawling into the farmlands of Middle Tennessee. We should have people living in town where they want to live. I also believe you can’t have it all. You can’t say, ‘We are not going to do Maytown; we’re going to leave this big bend and river alone’ and then not want people to live in the city. Q: You do have to give up something to get something. Density keeps taxes low. Do people fully understand that? “It’s the main reason. There were 8,500 total home sales in Davidson County in 2013 – that’s $2 billion in home sales. Not condos, not land, but homes. And half of that volume was sold in Area 2. When you add Areas 1, 6 and 7, it goes up to 80 percent. So half the eight areas carry most all of the tax load for this county. “I can give you many examples. “Down in Green Hills, in 2009-2010, we took two $300,000 rental houses. They’d been family homes for years, then the parents died, and the siblings rented them both. They were sitting on acre lots. We cut each of those acres into half acres and put two new homes on each one. “Each of those eight homes averaged a little more than $700,000 when they sold, so we went from $600,000 in real estate to $6 million in real estate. The tax yield on those two properties was originally $5,000 or $6,000 total; now it’s over $50,000 in tax yield to Metro every year – 10 times as much. I don’t want your taxes or my taxes going up, so this is what needs to be paying the bills. “You have a perfect storm of people coming to our city – people moving back, reversing the urban flight that happened in the 1960s in America. We’ve got builders and developers who want to build, and the infrastructure exists. Q: You’re very involved in planning and development policy. One thing you’re fighting is the Contextual Overlay District. Why? The Contextual Overlay District bill is a zoning change proposed by Metro Council that would allow neighborhoods to apply design standards to the homes in it. Critics like broker John Brittle argue that the COD is a rigid, one-size-fits-all approach that does not take into account the varied nature of neighborhoods, and contend that it will reduce the value and future use of homeowners and impact what they can do in the form of an addition or upgrade to their home. The COD’s prescribed set of standards looks at the context of the two neighbors on either side for setbacks, height and footprints. For example, if a COD were applied, the maximum height of a building could be 35 feet or 125 percent of the average height of the four lots adjacent, whichever is less. Therefore, in a neighborhood with a mix of one and two story houses, maximum house heights would differ. Critics of the COD say a better approach would be to allow houses to rise up to two stories, with a maximum of 35 feet. The COD also prescribes standards for access and driveways (only one driveway is allowed) and state that the doors of an attached garage must face the side or the rear of a property, and the doors of a detached garage set behind the home may face the street. The current tool available to a neighborhood that wishes to have an overlay to prescribe future design standards is the Urban Design Overlay District, which defines a specific area and sets specific standards for its development. UDOs are in effect for numerous Nashville neighborhoods, including Hillsboro Village, Primrose, Music Row, Lenox Village, Green Hills, Clayton Avenue, downtown Donelson, 14 miles of Murfreesboro Pike and Gallatin Pike between South 5th Street and Briley Parkway. The Multiple Listing Service is a database that Realtors use to list and access information about properties for sale. 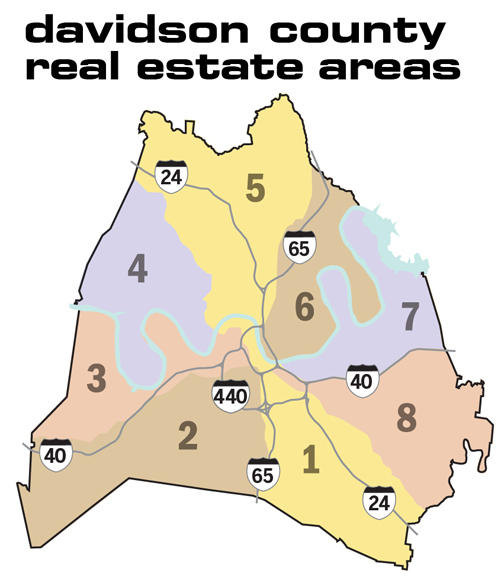 MLS divides Davidson County into eight “areas.” Following are descriptions of the eight areas. Area 1 is located between I-65 and Murfreesboro Rd in the southeast corner of the county and includes the cities of Nashville, Antioch, Brentwood, and Nolensville. Area 2 is located between I-65 and I-40 in the southwest corner of the county and includes the mailing addresses of Brentwood and Nashville. It includes Brentwood, Bellevue, the Lipscomb area, West End/Harding, Charlotte/West End, Vandy/Music Row, Oak Hill, Forest Hills, West Meade and Burton Hills/Green Hills/Belle Meade. Area 3 is located between I-40 and the Cumberland River to the west of Nashville. Area 4 is located between the Cumberland River and I-24 in the west/northwest part of the county. Area 5 is located between I-24 and I-65 to the north of Nashville. Area 6 is located between I-65 and the Cumberland River to east/northeast of Nashville and includes East Nashville. Area 7 is located between the Cumberland River and I-40 to the east of Nashville and includes Nashville, Donelson, Hermitage and Old Hickory. Area 8 is located between I-40 and Murfreesboro Rd to the east/southeast of Nashville. “I have some personal opinions about stuff that builders don’t agree with, and all the Realtors and developers don’t agree with. But I don’t believe we should have a conversation out there about whether I like contemporary or I don’t. The aesthetics of homes in America … every person thinks something different is pretty. I definitely have some really strong beliefs about size and height and massing and those kinds of things. But those are balanced, I hope, by landowner rights. Because that, for me, is the bottom line. “The defense of the Contextual Overlay District is that it’s just a tool. But I believe it’s a weapon for their toolbox, and I believe it’s not a necessary tool, because they already have the Urban Design Overlay. “I lived on Central Avenue when we added the conservation overlay. I know how it affected people. I’ve watched closely in Sylvan Park where a couple of different councilmen wanted a historic district, and the neighbors have not wanted to expand it. “With the COD bill, we’ve sent things in to show what some of the repercussions are. It has too many things that affect too many people who are just regular homeowners. “We are not concerned about it for Realtors and developers – we’ll adapt. We’ll go where we can go. They change the rules on us, well, that’s part of the risk of real estate and we go. “But homeowners are going to find out they can’t do what they want. They’re going to tell you that you can’t put a second floor on your house. Or you can’t add out the back and put a master suite and a kitchen and a family room because of the size of the two on either side of you. “The people at one end of the block and the people at the other end of the block have different parameters because of what’s on either side of them. Every single lot on the street has a different set of guidelines because the two people on either side are all different. And someone’s final exit strategy may be to tear down and build something nicer in it. And we’re going to let a small group of people without a required percentage of the sign-in do that? Q: Affordability is becoming a big issue for the middle class. How can we solve that issue? A: “I don’t know. Clusters of smaller homes is the answer, and because of greed by builders and developers over the years, we’ve lost that ability. I say ‘we’ because I’ve worked in Area 2 for 25 years. “You can drive around Green Hills and see all those little clusters and planned unit developments with those little postage stamp lots. They were building them for people coming out of these big houses and acre lots that wanted no yard, or a little courtyard. They were great because they were one-story and they were short and they were small, and they were the product that we needed in the mid ’80s and through the ’90s. “There’s probably 100 of those little clusters, between four, six and eight units, and all the way up to Sugar Tree. We got that density because the neighbors at the time agreed that we needed smaller houses and smaller lots. “Then somewhere in there – 10, 12, 15 years into that progression – the builders and developers started making big, three- and four-story deals on a little bitty lot. Then the political power in cities in America went from builder-developers in the ’80s and ’90s to neighborhood associations in the ’90s and 2000s. John Brittle along with Andrea Woodard, Broker with Parks, stand near some property they say will be the next Nashville hot spot for real estate. “They needed to try to regain some control, and they did. But it’s got everybody believing that nobody will do anything small and nice. And that’s not the truth. You have people who are trying. But now we are fighting some really restrictive regulations … and it takes an inordinate amount of time to get done. “When people start seeing stuff get torn down in their neighborhood, they start trying to figure out how they can limit it. So it’s conceivable that a neighborhood group could start a COD and get a COD on that lot faster than we can go through the process of getting it developed and built into houses, which is an untenable position because then we won’t have any more development in town and all this development will go out into the other counties. “We are anti-sprawl guys and gals here. We believe strongly that we should have people in the city, because I don’t see mass transportation in our near future. Q: Today’s buyers want smaller houses, now, right? A: “Yes. Six years ago, I had convinced a bunch of builders and developers to take these two family structures in the Green Hills area down to about 3,300-3,400 square feet. The ones I worked with, we reined them in and made them smaller. “Now they’re back up to 4,500-5,000 square feet. “Some of them say, ‘Well, they get more house for the money.’ That’s a horrible excuse. Some of them are trying to make their houses look better competitively by being bigger and lower price per square foot, when what they need to do is build them smaller and more sustainably, and do something conscientious that’s not overbearing to the neighborhood. “Young people and guys my age and older, people who could be moving down, they want a smaller house on a smaller lot. Because of the way our lots were designed and built in Nashville from the 1890s to the 1920s – and I know this because I study it – those lots are all 50 feet wide because they were drawn in groups in 25-foot sections. “Most people bought two or three or four of those 25-footers and built their house on it. Q: You can build narrow homes on them. But a lot of existing homeowners really hate that aesthetic. You’ve seen the “Build like you live here” signs in neighborhoods. “But I think it goes further than that in some instances. Some people just don’t want people who are different from them in their neighborhood. And if you don’t believe that, I can send you down some streets where you can ask them yourself. There’s a lot of bigotry out there. “I’m out there on the street every single day. And it offends me that someone who’s lived in the neighborhood for 10 or 20 years thinks their vote counts more than the new people’s vote. It’s the same thing as 20 years ago, when gentrification started and people told you they didn’t want you to build a big new single-family home, and you went and built a big huge 4,000 square-foot house anyway. “And now you are telling the people coming in who want smaller homes that you don’t like their little bitty houses? “There are about 4,000 of these out there now – these smaller homes, whether they’re skinny or tall or just little. The two fronts on the street, some people like it and some people don’t. The young people and the retired people that are buying them absolutely love them. Q: Is the real fear that property values will go down? A: “There are all kinds of different reasons people are against this kind of thing. I have a lot of people say to me, “I don’t want these little houses. They’re going to turn into a rental.” They come to these meetings all the time and say they don’t want rentals in the neighborhood. It’s interesting. “Well, they’re ignorant, and they don’t know what’s going on. Every time somebody takes one of these university-area cute little bungalows or cottages and takes the apartment out of the upstairs, they have to be replaced. Where are we going to do that? They are taking away the duplex abilities all over the city. “If we want to build rental duplexes, we couldn’t do it in half the city. If I told you how hard it is to get approval for a 6-, 8-, 10-, 12-unit rental ... it’s really hard to get multi-family built in Nashville, and we don’t have the zoning for all of that. Q: You talk with homebuyers and Realtors every day. Who are the people moving here to live? “It’s an amazing mix. I’m really heartened by the diversity of who’s coming here. I believe that we are getting a little bit of everything. People who ‘bounce back’ here … they leave the north, go to Florida and then come halfway back, somewhere kind of temperate – Georgia, the Carolinas, Tennessee. “The West Coast has always been sending people here. People are coming here from other places that they just don’t think are working. Q: And where do they want to live? A: “We know what they want because our Realtors come in every Tuesday and report on what they want. We are at the open houses every Sunday. We know what’s selling the first day. 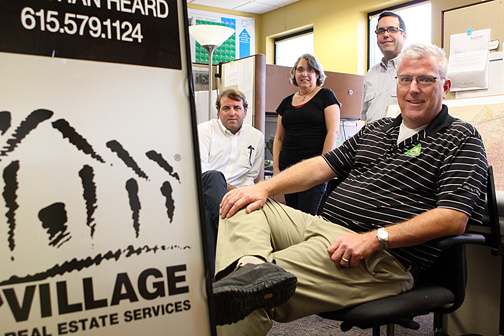 John G. Brittle, Jr. (foreground), director of land sales for Village Real Estate Services, with team members (from left) Jonathan Heard, sustainability coordinator, Brenda Bernards, director of planning, and Richard Parker, director of marketing. “Out west, Sylvan Park is done. There isn’t anything left. Lockeland Springs and East Nashville is done. Madison and Donelson, I’ll see you soon. We’re already there; we are doing research. TSU, Fisk, Cleveland Heights, Cleveland Park, Woodbine, Glencliff … all of that stuff is well underway. “The whole Nolensville Road corridor all the way down to the zoo, all the way to Harding Place … everything down to Thompson Lane and Grassmere is infill. Lots of areas of Area 1. “They will write books about The Nations. There are neighborhoods coming right now with about 200 new homes. One is a group of about 100 townhomes. Another is a development of 60 single-family cottages. And a third is a cottage development of about 40. “And then the stuff that individuals are doing in groups of two and three and four, that’s another 200. So there are 400 new homes coming to The Nations in the next 18 months. There are already 200 that have come there in the last 18 months. Neither 12th South, East Nashville or North Nashville, Salemtown, Germantown … nobody saw that kind of explosive growth. Q: You’re talking about parts of town that five, ten years ago, Realtors traditionally would not show to a middle-class buyer. It seems like everyone’s an urban pioneer now. “Part of it’s about what we as Nashvillians have historically believed about where people ‘will’ and ‘should’ live. As a Realtor for half of my life, we didn’t go to Area 3. We didn’t show people wanting a new house north of Charlotte, north of the interstate. It’s Area 3, for goodness sake! The prison’s over there. Now all these young people, all these people moving here from big cities, they are not affected at all by what’s across the street from them. They don’t care if there’s a warehouse over there, because that’s how they grew up. They don’t care if they are looking at a big brick wall. “Over by the (Nashville) Fairgrounds, there’s a place where there’s like an acre with all these huge antennas and satellite dishes for Nashville Public Television. Have you seen all the brand-new houses across the street? Q: You must hear a lot of pushback from long-time residents. “Change is tough. I mean, nobody wants to accept that their neighborhood is changing, or their side of town, or their city. People say to us, ‘Well, we think Nashville is about where it needs to be and we’re just not for any more growth.’ And I am sorry to inform those people that they should just go ahead and move away. They should just move out to the country. “Every few months I hear somebody say, ‘Oh no, everybody’s fleeing Green Hills.’ Well that’s the silliest thing I’ve ever heard. Somebody might have fled Green Hills because they wanted to live on an acre, and they didn’t want to have any traffic. “That’s a regional activity center with a Macy’s and a Nordstrom’s, and everybody’s flocking to Green Hills. “When they rebuild Hillsboro High School and make it taller instead of sprawling, it will help the traffic. And adding all those apartments in the middle of Green Hills, I believe is not going to affect them as badly as some people think because all those people will be walking. “As those things happen, yes, traffic’s going to be worse because there are going to be more people. The planners know that we need connectivity through all these neighborhoods, because you need to have some of that traffic filtering down through different parts like Lealand and Granny White. But nobody wants that traffic coming through their neighborhood. “As we reshape metropolitan America, the people who are living there already just need to accept that they are going to have new neighbors. They don’t always like it. I believe that when you put new people into a neighborhood, you revitalize parts of it. Is that moving out a lot of people who needed rent to be at a certain level, and moving them further away? Absolutely. “In Brentwood and Franklin and Williamson County, the people who work at restaurants, they don’t get to live down there. Franklin doesn’t want any new multi-family. So they’re going to have worse traffic because those people will have to drive from LaVergne and Smyrna. “They are unwilling to put in new rental properties. Well, which district do you think we are going to put it in? We are going to have to evenly spread it around the city, because it’s growing in every part of our city. “The Nations has done really well over the last few years and will continue. It’s going to connect with Germantown, Salemtown and Hope Gardens. And where does it connect? Right down Jefferson Street. TSU and Fisk is where it will happen because of the proximity. “We are over there every day, and we don’t go selling stuff and building new houses until we’ve studied it ad nauseam because we’ve got to look at the flow and understand the traffic. We’ve got to understand where people live and where future people will live. “There are some areas out there that are going to get a lot of pressure, and we will be having some really interesting neighborhood meetings over the next three to six months. We’re going out to some neighborhood groups and churches and talk about how that pressure comes and how to deal with it. Q: You’re talking about the recent case in the news in which a group called Property Savers paid an elderly couple $50K for their house and resold it, same day for $75K. “I take phone calls or emails every day from these flippers, wholesalers, diggers or whatever kind of loser they want to call themselves. They are out there trying to get a contract and then sell the paper. They don’t intend to buy the property. It may have their name on it, but they don’t intend to take ownership. “They call people like me and my clients, and then my client is buying something for $110,000 that somebody got under contract for $80,000. And it should have been for $150,000. “So now when I’m showing something for $150,000 and the client is going, ‘Golly, I can get something a lot cheaper from these other guys,’ you find out that these little old ladies or elderly couples undersold it by 50 percent. And that means somebody potentially chose not to give them what it was worth. “Part of the issue is, the value is changing every month or two or three. “The Nations, for instance. We were selling little tear-down houses and lots there a year ago, 18 months ago for $60,000 to $80,000. Then they went to $100,000 to $120,000. This week they’re worth $150,000. “They have doubled in value in 24 months. So you’ve got to keep updating them every month or two or three, because there are people who are unscrupulous and don’t care about community building, who just want to steal something, and the public is hurt when they don’t get independent information and they fall victim to this. “It may have been worth $100,000 a year ago, or $130,000 days ago, and now it’s worth $150,000. Just because somebody says to you, ‘Well, the last one sold for $100,000; it’s only worth that’ … that’s not what we do and we are going to combat that. We are going to find a way to get the information to the community. “The preamble to the Realtors code of ethics talks about widely distributed homeownership. I take that very seriously. It talks about the best and highest use, but it talks about what’s best for the community and how we should be making sure that we have places for everybody to live. “There are repercussions of people offering somebody too little for their house or their lot and they’re flipping it to a fake middleman who profits. Then when somebody tries to go back in and do a conscientious, sustainable little cottage court development, or smaller homes, people have a bad taste in their mouth from the whole process, and we end up in a bad place. “I get painted with that brush. I think we can do good. We do good for our clients and investors, obviously. We bat 1.000. We don’t make mistakes. But I think we can also do good for community. And I think we can do good for people who need help. “We had a guy who we went and talked to who had a ‘For Sale by Owner’ sign in his front yard. He was trying to make the price so high that everyone would just leave him alone, but he didn’t realize that the values had caught up to him. He had been having people offer him $120,000 and $150,000 when it’s worth $300,000. “Now this guy is going to get $300,000, and he deserves it. We will be working on his [house] this week and on three of his other neighbors, because they didn’t all understand that it had gotten to that number. We are going to have to do a whole lot of stuff to get it to be worth that, development-wise, but we think we can. Q: I’m sure a lot of minds are spinning at these land values. These prices just sound unreal, in areas you never would think. A: “Everything in Sylvan Park is up to $500,000 now. So now we’re over in The Nations. A 1,800- to 2,000-square-foot house in The Nations, which right now is $339,000, will be $399,000 by springtime. That house was $299,000 six months ago, and 18 months ago it was under $225,000. “Somebody, a Realtor that we follow, wrote recently that those Nations lots are a bubble. That’s not a bubble. They were devalued two or three years ago. “If the home-buying public is willing to go look in Germantown and Salemtown, and they’re willing to go look in The Nations, and they’re willing to go look in the Music Row area, and the 8th Avenue area, and the fairgrounds and the baseball field off of 4th Avenue, and Cleveland Heights … that means that the homebuyer who’s coming in from out of state, or the young homebuyer who’s here making decisions for themselves now, they’re not letting their parents tell them they can’t go live on a certain side of the street. “They don’t have those prejudices. The Realtors, we are getting over our prejudices. And I’m not talking about racial prejudices, I’m talking about geographic prejudice. “I live in Area 1, across I-65 toward Crieve Hall. We were the wrong side of the tracks forever, because the Realtors all punched in Area 2. They didn’t search Area 1. Q: Devil’s advocate here. Shouldn’t your builder-developer clients get the cheapest land prices to maximize their profit? A: “There are a lot of other things that you owe a duty to – like community-building, and being fair to both parties. There’s just some stuff that isn’t being done the right way. “We are going to make sure that everybody knows that there are buyers out there who will pay you what it’s worth – the definition of ‘worth’ changing every day. “Are we really, in our industry, going to go out and offer people $100,000 or $150,000 when it’s worth $300,000? Why not just find this person the best buyer for their property and then sell the darn thing and build some houses? Then everybody wins. Because it’s going to be worth $330,000 in three more months. “When the neighbors find out that, in addition to having stuff built that they don’t like, their neighbor of 30 or 40 or 50 years got hosed by somebody who didn’t give them a fair price, then you have an uproar that becomes untenable. “We can’t deal like that. All of a sudden you get haves and have-nots, and builders and developers versus the community, and it’s not the way. “Can I come in riding a white horse? No. But I can share data with people. “I’m concerned that we’re going to lose all these areas for development if someone doesn’t go and be honest with people. So we are going to start having some conversations about current value. “Those of us who believe in what we do, even if we are trying to get a deal, we are competing head-to-head every day. But we believe in the community and in our city, and we believe that it is less tumultuous if people who have been paying their taxes on it for 40 years can get rewarded for that. “That’s what I believe. And it’s not some holier-than-thou thing. I believe that if we do that, we’ll get to buy more of them. “I’ve been able to have a reasonably successful real estate career and sleep at night without feeling like I hosed anybody and stole their property from them. “Everybody ought to be able to sell their property for what it’s worth. I’m not going to finish out my career underpaying people for their stuff just because we are trying to look for a deal. We’re not.